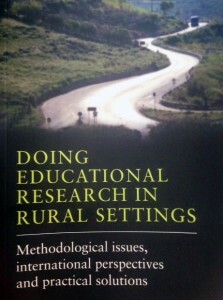 Doing Educational Research in Rural Settings: Methodological issues, international perspectives and practical solutions. Simone White & Michael Corbett (Eds.) Routledge, 2014. Taking up the “key question of how to conduct educational research within and for rural communities”, this book contains a diverse collection of approaches to the many still-incomplete issues under the sign of rural education, its transformations, challenges and study. Linda contributes a chapter (Research and Remembrance in a Rural Community: A Step Toward Ethical Learning) inspired historical video-ethnographic projects in BC School districts in the West Kootenay and Arrow Lakes regions of the interior of British Columbia. These are projects #1 and #2 on our Growing Innovation page. We also have collected links of the videos from the Arrow Lakes project, and have produced our own video (“Growing Innovation: Digital Heritage Connect“) in collaboration with schools in the Slocan Valley of the West Kootenays about their video projects. We hope you will appreciate all of the Growing Innovation videos now available. For more on Doing Educational Research in Rural Settings, here is an amazon link as well as one to the publisher’s book page.